With the release of Paranormal, Alice Cooper's 27th album, the rock icon finds himself something of a survivor. Most of his musical peers have either faded into obscurity or sacrificed what made them special to begin with, touring every summer with what amounts to a tired greatest hits catalog with no new music on the horizon. Not so with Mr. Cooper, who continues to craft new material, be it on his own or with his friends, such as Joe Perry and Johnny Depp with Hollywood Vampires. Alice Cooper has always been one of the hardest working men in rock and roll. But there's something different about Paranormal. There's a driving energy behind the album that harkens back to a time long gone, when rock music dominated the radio airwaves and raising your fist and yelling was a the preferred way to let off some steam. Paranormal feels like Alice Cooper in his prime. Some critics and music fans have placed it in their top five Cooper albums of all time, and while the modern trend of ranking everything seems to do a disservice to Cooper's massive body of work, there might be some truth to those lists. What sets Paranormal apart from a lot of his other albums is the fact that it isn't a concept album. There is no continuing theme that connects the songs, which allows the collection to have more of a loose vibe. Cooper himself has described the album as "12 great episodes of The Twilight Zone," and that's about as apt a description as there could be. Each song has its own personality and mood, but still feels distinctly "Alice." What's more, Cooper really shows his vocal range on the album, from the growling hard rock persona of his classic material to the softer, more nuanced style displayed on his classic ballads, there are a lot of levels here. The songs themselves are fantastic; hook-filled and hard-rocking, each one seems to represent a different mood or atmosphere. The album opener, "Paranormal," has an arena rock feel with harmonizing guitars and a trademark theatrical flair. "Dynamite Road" is a driving, riff-laden track about hot rods and the devil. "Holy Water" is a jaunty, horn-filled gospel song with a dark twist and a chorus that stays in your head for days. With topics like the apocalypse, rats, split personalities, and transgender pride, this is classic Alice Cooper subject matter, but delivered with a panache that seems like a combination of multiple eras. 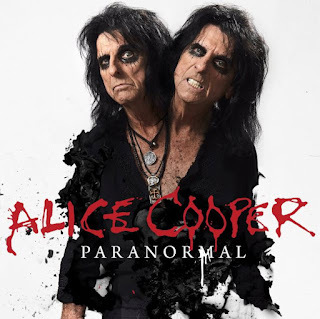 The album is also special because it contains two tracks that feature the reunited surviving members of the original Alice Cooper band, who hadn't recorded together since they broke up in the seventies. They sound as good as--maybe even better than--they did all those years ago. Particularly impressive is the drumming of Neal Smith. All of these guys, including Alice himself, are 69-70 years old, proving that age means nothing when it comes to rock and roll. As a final bonus, the two-disc package contains six live tracks of Alice Cooper's biggest hits, recorded in Columbus, OH in May of 2016. This is presumably here to promote Cooper's outstanding (and seemingly never-ending) live tour dates. Bob Ezrin, the man who produced some of the most recognizable albums for Cooper, such as School's Out, Billion Dollar Babies, and Welcome to my Nightmare, as well as KISS' classic Destroyer and Pink Floyd's The Wall, is once again sitting in the producer's chair and twiddling the knobs (with co-mixer Justin Cortelyou). Even Ezrin seems rejuvenated, like something has been rediscovered. This album just feels like the Alice Cooper that you know and love. It might be overreaching to call this an instant classic, but it's undeniably strong and built to last. All in all, Paranormal is a blistering record filled with cleverly written songs by a guy who always had a way with words. It's biting, sarcastic, jubilant, creepy, and always tongue-in-cheek. In short, it's very Alice Cooper. The production feels timeless and sits alongside some of Cooper's best. After nearly fifty years of music from Alice Cooper, fans have justifiably-high expectations. Paranormal delivers.